This review will probably contain some SPOILERS, just because it’s about the fourth book in a long series. So don’t read this review if you don’t want to be SPOILED. I had some mixed feelings going into this book. While I don’t like some of the characters in The Selection series, I do like some of the plotline, so I was excited to pick this up and see where America and Maxon went, but I was also hesitant because of the way Kiera Cass writes. And unfortunately, my hesitation won out in the end. The idea of a princess being in line for the crown is cool. But Eadlyn is supposed to be dedicated to her work, with no time for romance. Yet, she doesn’t actually every seem to do a lot of work, she just does a lot of paperwork. And I feel like that’s not all a ruler should do. Even her father, the king, was doing paperwork. I mean, doesn’t he have advisors to do that work for him? And shouldn’t he be visiting with his people? And actually finding solutions to his country’s problems instead of forcing his daughter to marry? Basically, once again, Cass set up a world, but didn’t really put a lot of thought into how characters, events, etcetera, would actually pan out. I also felt like I didn’t really get to know Eadlyn. I got to know America really well in her books, I may not have liked her, but I knew her. Eadlyn’s character development was just lacking something. Despite all of my grumblings, I did find the idea of this new Selection very entertaining. I also enjoyed seeing America’s new family and I will definitely be reading the next book to see what happens. 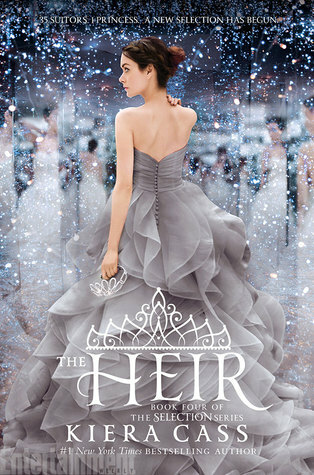 All in all, The Heir is a book that I encourage you to wait to read. Wait until the next (and last) book comes out so you don’t have to remain frustrated with the small, frustrating parts of the book. Perfect review! I am reading the book now and nearing the end of it. I feel all of the exact things you felt. When one of the boys "giggled" I was like "Okayyyy, that doesn't sound right". I also didn't really like Eadlyn, I mean I could have but I feel like the author rushed her character development. I found myself getting bored with her and often annoyed. While I did like America even with her flaws, her daughter is a bore and too rude.